The archaeological team from the British Museum and Durham University found striking evidence of tumors which had metastasized through this 3,000 year old skeleton. The bones were uncovered last year in a tomb located in the Sudan. This discovery suggests that cases of cancer could be found in the Nile Valley at roughly the same time period that David was crowned king of the Israelites. From the skeleton, researchers surmise that it had been a man in his 20’s to 30’s. He was discovered inside a painted wooden coffin. The archeological team also uncovered numerous other skeletons at the Amara West site. Cancer is one of the leading causes of death in the modern world, but there is virtually no presence in the archaeological records compared to other common diseases. This has led to many theories that the incidence of cancer is largely linked to our modern day lifestyles and longer average lifetimes. The discovery of a 3,000 year old skeleton who developed metastatic cancer show that these diseases are not only a modern issue but an ancient one too. Binder believes this will provide scientists with an avenue to investigate the incidence of cancer in ancient populations. 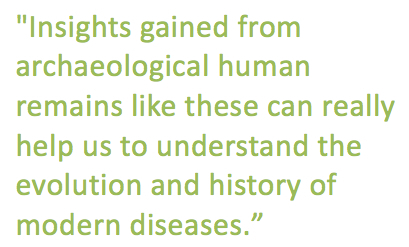 It should also provide some clues as to how these diseases have evolved over time. What Caused This Ancient Man’s Cancer? An infectious disease like schistosomiasis is one of the more plausible causes, given this particular illness was fairly common in Egypt and Nubia since 1500 BC. Current cancer clinical studies have shown that schistosomiasis can cause breast cancer and bladder cancer in men.